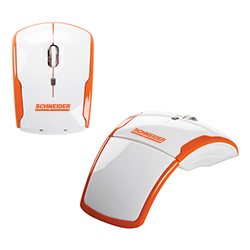 2.4 Ghz full-size optical wireless mouse that folds to compact travel size. 2 way transmission technology, operating range 30 feet. Plug and play nano receiver. Windows PC, MAC compatible. Battery status indicator, super energy saver with low battery consumption.